Don Britton 1950 Ford Sedan was restyled in 1950 by Chuck Calvin who sectioned the body for an unique look. Where is this well published Custom now? 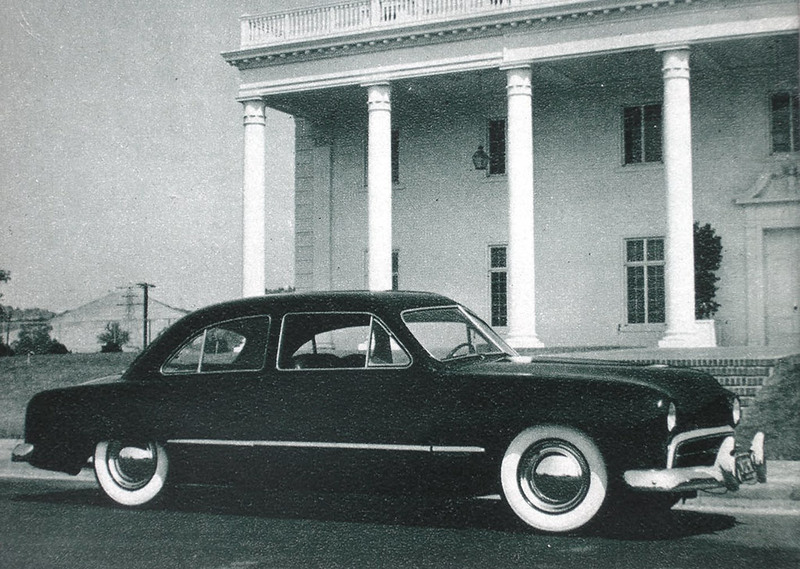 This elegant 1950 Ford sedan Custom Car has been featured in quite a few publications in the early 1950’s when the car was near new. Yet it never was one of those “popular” Customs that most people think about when you mention Custom Car. The Don Britton Ford always has had a bit of mystery around it, at least that is how it felt to me. 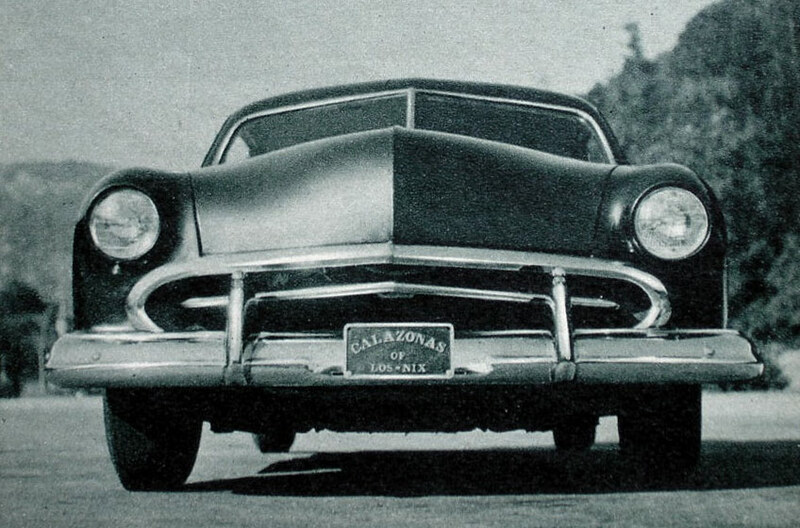 When the car was featured in the 1954 issue of Rod & Custom Magazine it was mentioned that in a very short period the car had changed hands several times, and therefor the original owners and builders name had been lost. That always sounded a bit odd to me, especially since earlier publications from 1951 had clearly listed Don Britton as the owner and Chuck Calvin as the builder. 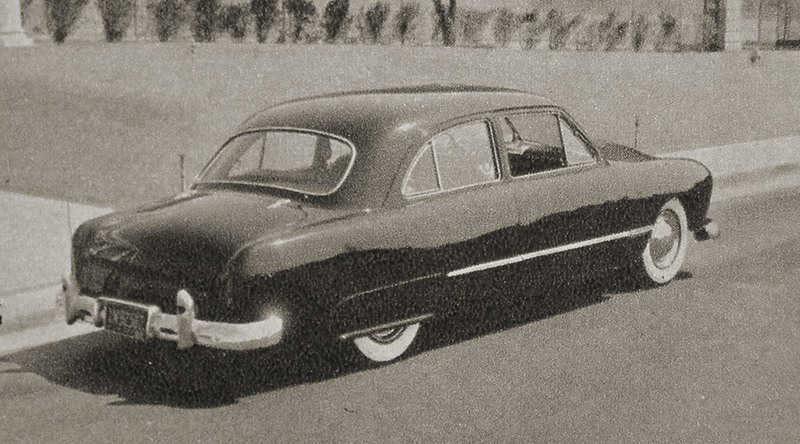 Even today when creating this article I find odd things about the car… In fact I’m still not even 100% sure all the photos used in this article are of he same car… or perhaps there were two nearly identical 1949-50 Sectioned Ford Sedan’s. In progress photo appeared in the 1951 published Trend Book #101 Custom Cars. The photo shows the car was lights colored and all the black areas is where the body work had taken place. Lets start with the things we know. 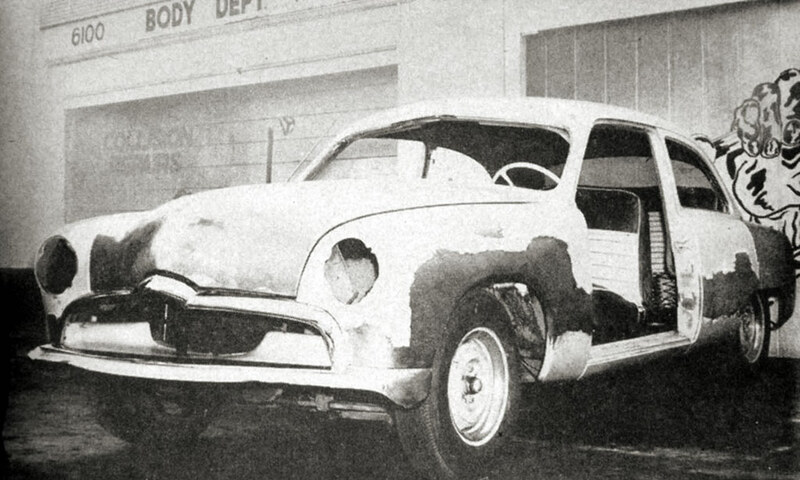 The very first Custom Cars Annual, Trend Book #101 first published in July 1951 showed a few photos of the Don Britton Ford Sedan, one of them of the car in progress with most of the work done, and the body partly in primer. The photo was taken in front of a body shop that I so far have not been able to identify. Not sure if Chuck Calvin, who was listed as the body man of the car in the same booklet on page 81, had his own body shop. Also included in the booklet was a wonderful photo of the Sectioned Finished sedan parked next to a bone stock 1950 Ford to compare the two. 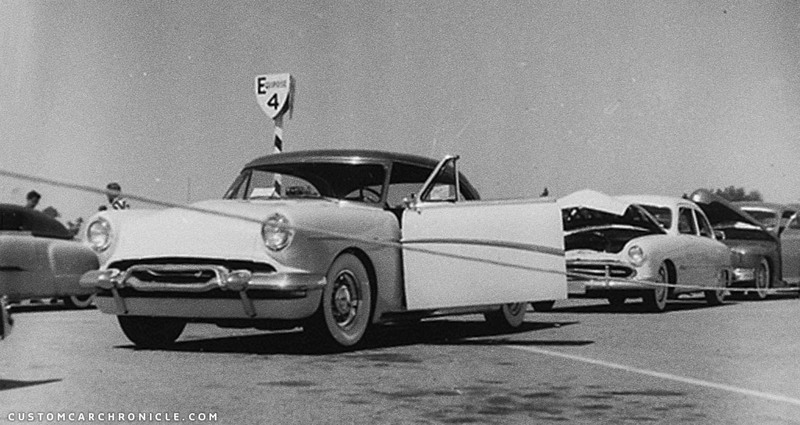 The Don Britton Sectioned sedan parked next to a bone stock 1950 Sedan. Don Britton was the owner of the D&B Auto Sales Lot on 8221 Santa Monica Blvd. in Hollywood, California, a second hand car dealer specialized in Hot Rods and Custom Cars. 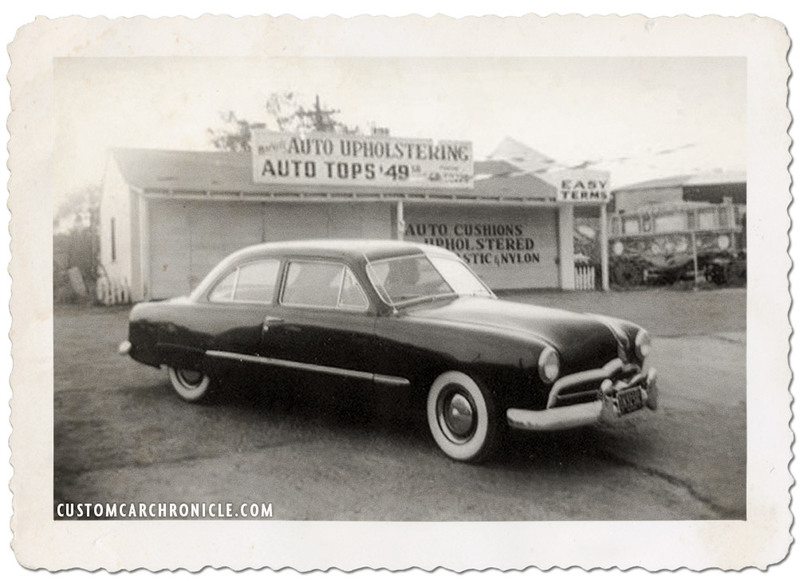 We do not know how long Don actually owned the car, but it cannot be very long, since in 1952 the car already had moved to new owner. Possibly Don had his sectioned Sedan parked at the lot, as he most likely used it as a daily driver, and somebody visiting the lot, in search of a new Custom Car made him an offer he could not refuse. First version of Don Britton’s 1950 Ford, possibly with Don behind the steering wheel. 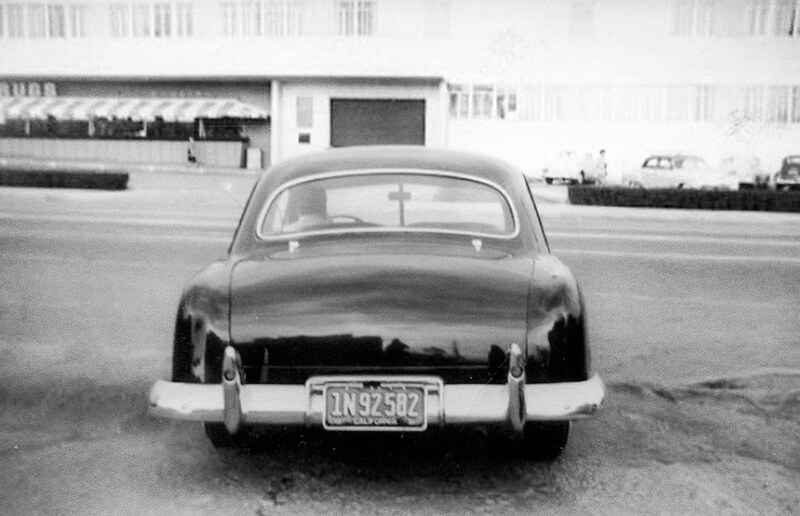 The rear view shows how the taillight wind-splits had been removed from the rear quarters, and new taillights were added in round holes in the 1949 Ford bumper guards. Notice the 1949 Chevy license plate suround. 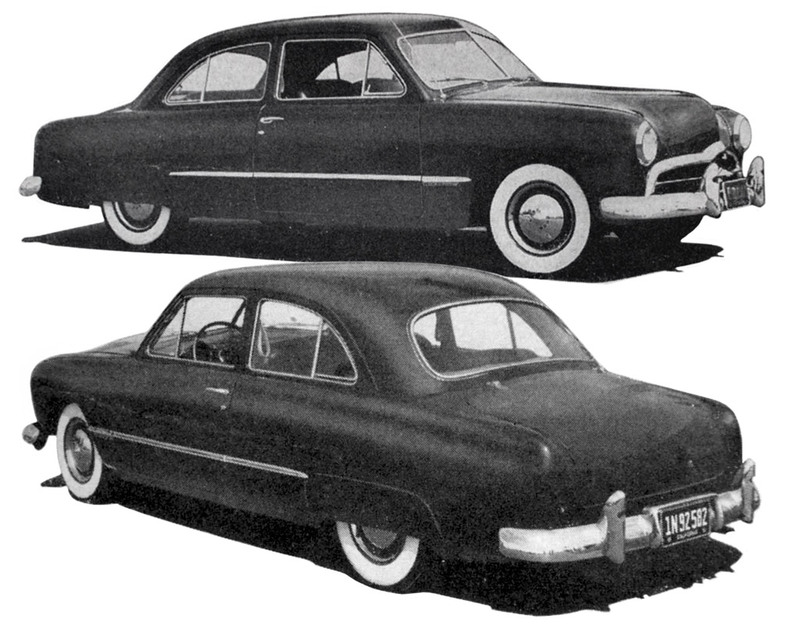 The firs time I saw pictures of this sectioned Shoebox Sedan was in the Fawcett Hot Rods book published in the early 1950’s the same booklet also had a couple of pictures of the Valley Custom Shop sectioned Ron Dunn 1949 Ford Coupe, and I really enjoyed comparing the two. In my eyes the Coupe Body of the Ron Dunn Ford lent itself better to the sectioning restyling than the sedan, especially with the top remaining stock height, which caused the Sedan to look slightly top-heavy… But I still was intrigued by the Sedan, I liked it a lot. 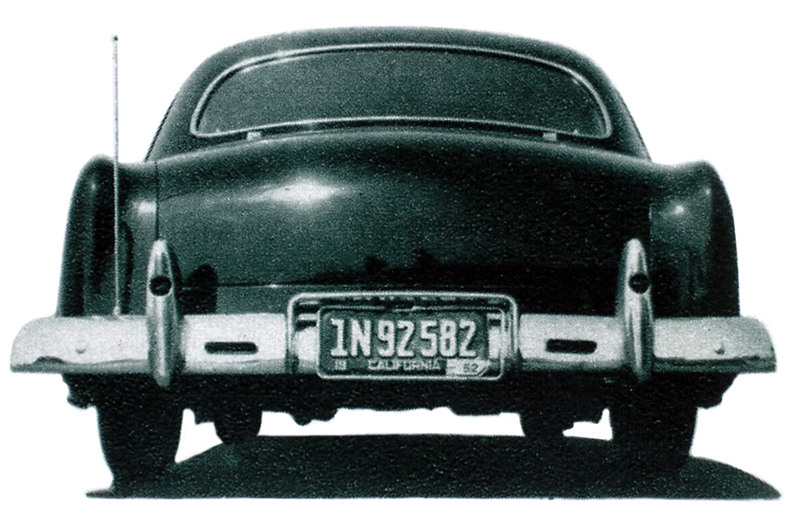 The original version of the Don Britton Ford shows the car with the door handles in place, stock headlights, stock looking fender skirts, stock hubcaps, shortened rear quarter side trim, exhaust below the stock rear bumper with 1949 Bumper guards with integrated taillights. The first version of the was not modified all that much, apart from the 4 inch section job the car dis have a rather stock appearance to it, which made it a very interesting custom. I could see how many people had to turn their heads when the car cruised the streets of SoCal. Viewers probably thought this was the newest model from the Ford Dealer. Especially since all the rest of the restyling was done so restrained and elegant… enhancing what was already there. The other custom touches on the car are; The 1949-50 Ford grille surround was cut down at the bottom to fit inside the new reduced opening. The original Ford spinner grille was replaced with a single very elegant 1951 Kaiser floating grille bar. During the sectioning process it was decided the body would look better with the taillight wind-split removed, and the rear quarters smoothed. The taillights would later be incorporated into he bumper guards. Similar lights were also added to the front bumper guards which were used as direction turn indicators. The trunk had to be cut 4 inches to fit the new reduced in height opening, and the trim and emblems were removed at he same time. The hood also was shaved of the Ford letters and center trim. The front wheel openings were slightly radiused with a more rounded top portion, to make sure the front wheels would not rub on steering. The low mounted side trim was shortened on the rear quarters to stop right in front of the stock accessory fender skirts. With all the body work completed the car was painted metallic maroon by Ted Nielson. Howard Markel did the interior in gray and black leatherette. The suspension was lowered just a little bit to get everything back in proportion after the sectioning. The plan was a slight level lowering which was accomplished using lowering blocks in the back. The front end was dropped cutting two coils. This brought the car down to the perfect level right height. The original version of the car used the stock Ford hubcaps. Howard Markel of Beverly Hills reworked the seats. He removed the lower, movable section of the front seat and reworked to bottom section to be mounted to the floor. The rear seat cushion and springs were cut down and rebuilt to sit level with the side window openings. The steering column location was also modified to be just right for the new seating position. 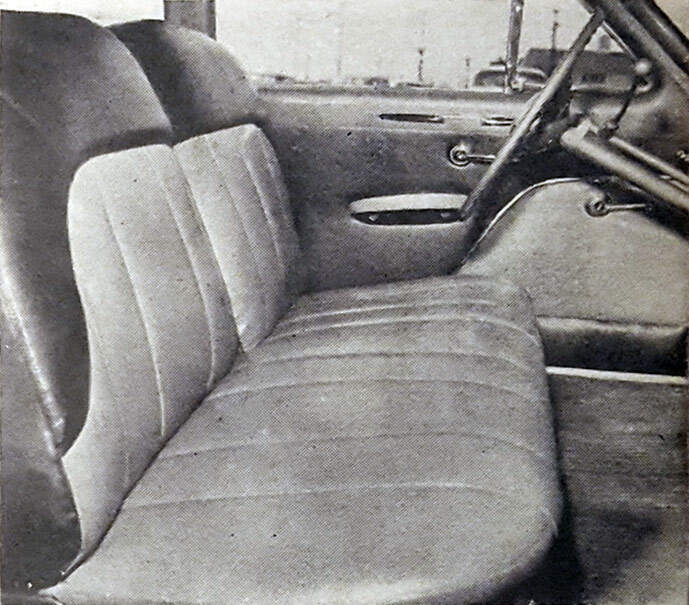 The interior was upholstered in gray and black leatherette. 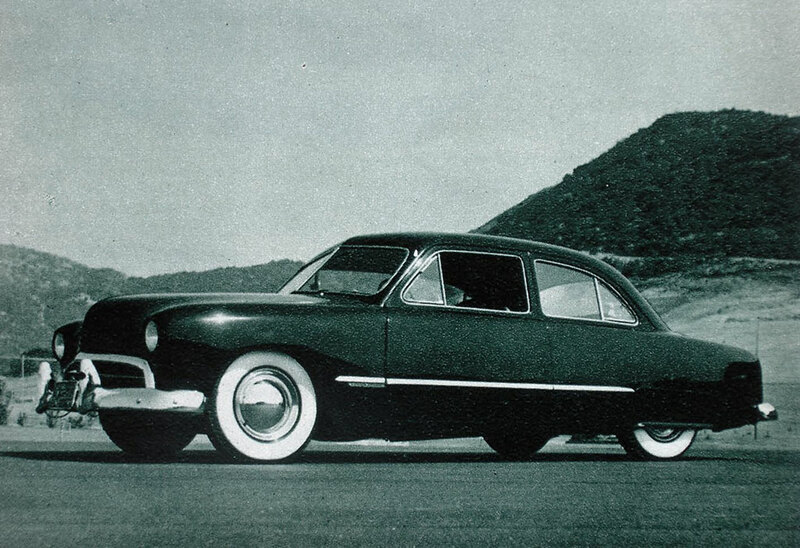 The finished first version of the car appeared in the 1951 Trend Book Custom Cars #101, and the July 1951 issue of Motor Trend. Chuck Calvin who was the body man responsible for the restyling and the sectioning of the body. The ’51 Motor Trend Magazine and 101 Trent Book Custom Cars has the car listed with with a 4 inch sectioned body, while the 1954 R&C magazine has it listed as 5 inch! 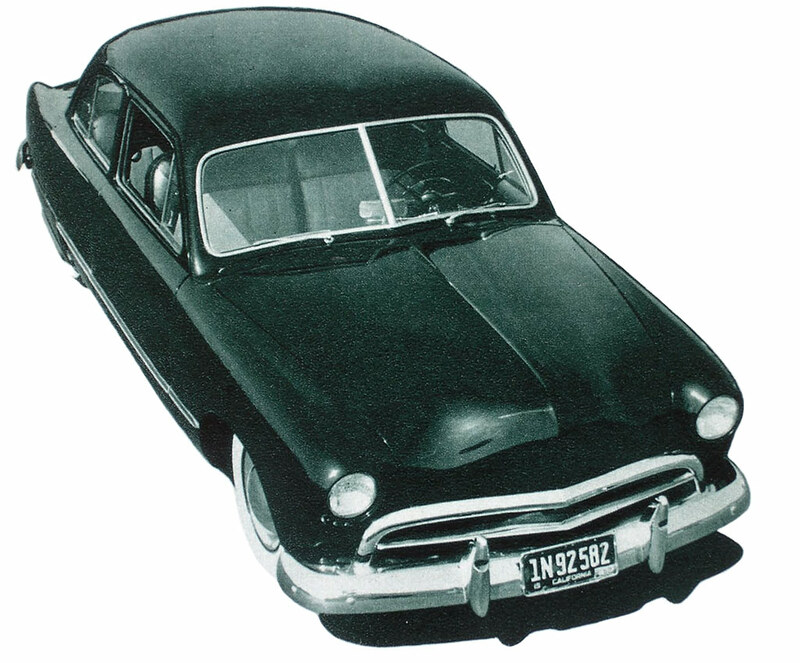 In the October 1952 issue of Hop Up magazine the Sectioned Sedan was featured again. By now the car had changed hands and Dana Boller was the new owner. The car also had done some more restyling in the meantime. Not sure if these modifications were done while Don Britton owned the car, or after it had changed hands. The car was now listed as an 1949 model while it was listed as an 1950 model in the 1951 publications. The door handles were removed and push buttons installed for all the openings. The headlights were frenched with a nice small lip. The grille surround was completely redone as well. a modified 1951 Ford grille surround was added that eliminated the 49-50 round center piece that was on the car before. The hood had to be filled in and a new peak was added to flows very nicely into the center of the grille surround. The car looked more custom in this version with the frenched headlights, ’51 Ford grille surround, lipped skirts and aftermarket hubcaps. Hop Up photographer Ralph Poole photographed Dana’s Ford with and without the fender skirts to show the readers the difference. The no skirt option makes the car look much lighter. 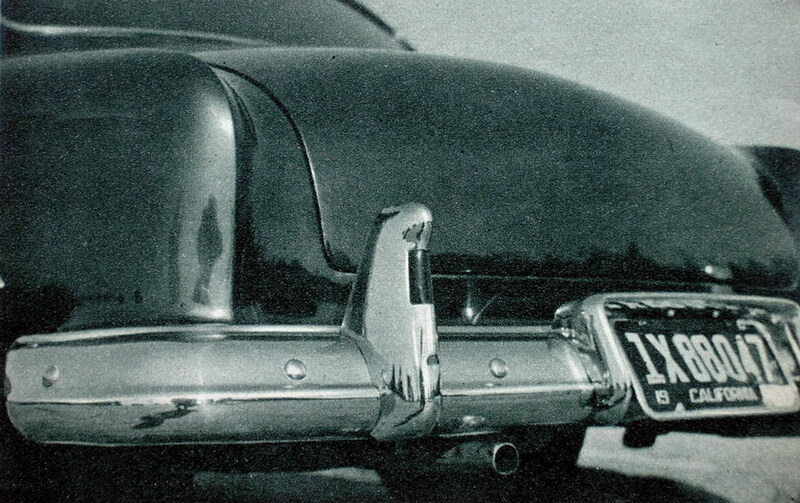 New fender skirts were added, possibly aftermarket units, or cut down 1951 Mercury units. The antenna was moved from the stock location on the cowl, to the rear splash pan, a popular locations at the time. Also new for the Dana Boller version are the rear bumper exhaust outlets. A better look at the new exhaust outlets in the rear bumper. Close up of the bumper guard taillights and the splash pan mounted antenna. 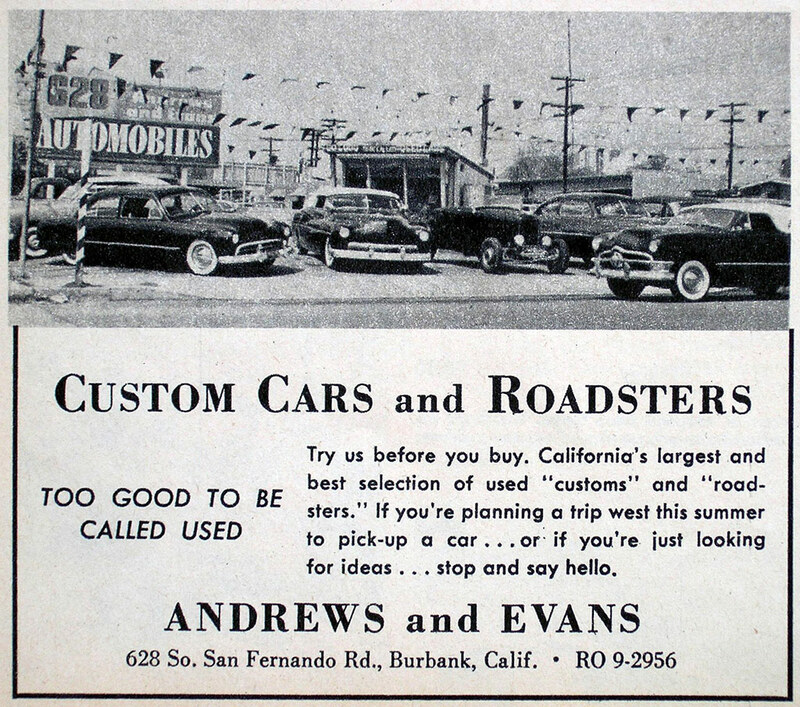 The Andrews and Evans sales lot ad showing the Ford on the far left was in Hop Up July 1953. From here on I have to say that I’m not 100% confident the car shown below is the same as the Don Britton Ford. There are some different details, including a new ’51 tag license plate, but for multiple reasons I do think this is still the same car. 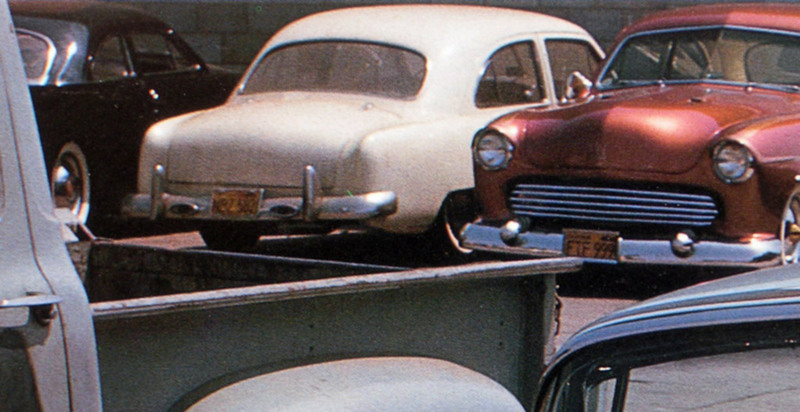 Mike Stone’s 1950 Ford had a four page feature in the July 1954 issue of Rod & Custom Magazine. 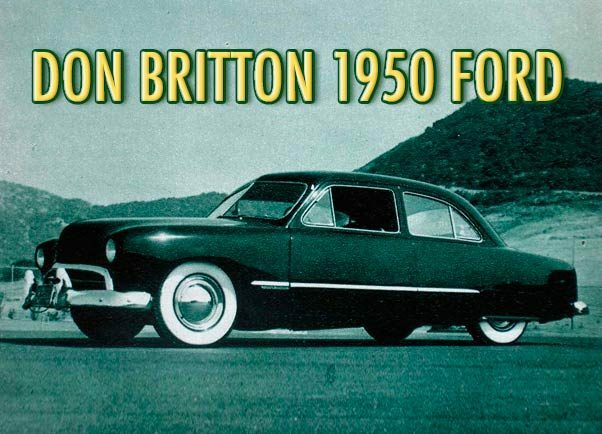 Spence Murry spoke highly about this car in the article, and mentioned the cars mysterious past, which is very much the same as what is discovered about the Britton Ford. The Mike stone version of the Ford was even more elegant than the earlier versions. The removal of the skirts, addition of the full length side trim and use of ’51 Ford bumpers and guards made it look very sharp, and classy. 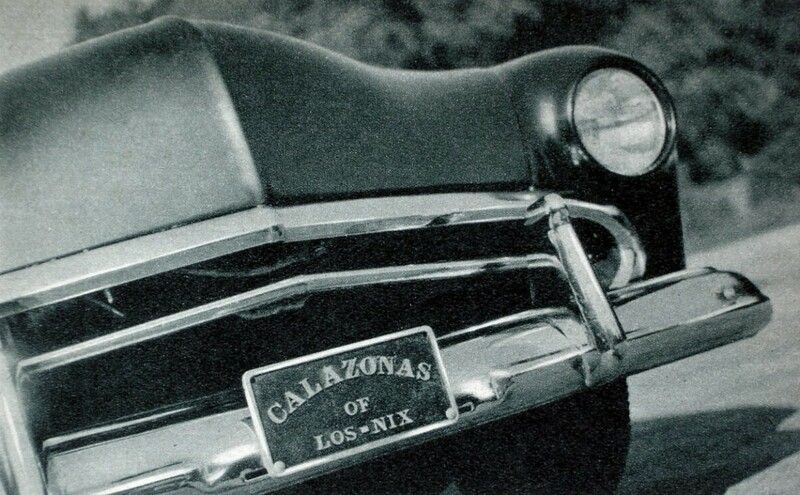 The Don Britton and Dana Boller versions of the car had a 1951 California license plate 1N92582, the Mike Stone car has 1951 California plates 1X88047. We have seen this before on other famous custom cars that had different plates over the year. 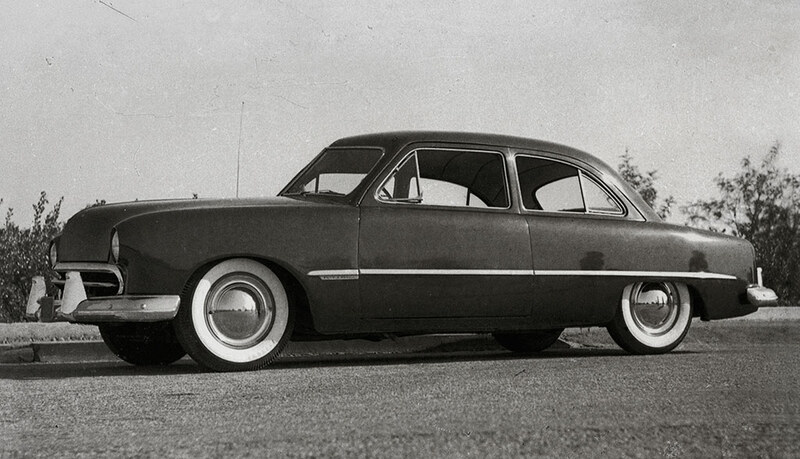 The most striking changed to the car are the use of 1951 Ford bumpers and bumper guards. The front bumper guards are stock, but in the rear new handmade vertical taillights were added. Resulting in a more elegant solution than on the early version, plus as an extra benefit the taillights are not also viable from the side of the car, an important safety feature. Also new on this version of the car is the grille opening. It appears as if a the grille surround from the previous version was modified with the use of a second 1951 Ford grille surround, which was flipped upside down to create a complete chrome grille surround. The Kaiser grille bar remained. Another change for this version is a full length side trim, which appears to be located a bit higher than on the earlier versions. This is one of the things that make me wonder if this is actually the same car, or perhaps there were two near identical sectioned Ford Shoebox Sedans? Close up of the new grille surround. This photo shows the nice peak added to the hood, and how it flows nice with the grille surround center line. With the use of the new 1951 Ford bumpers the exhaust was now re-routed to go back under the bumper again, just as it was on the original version. 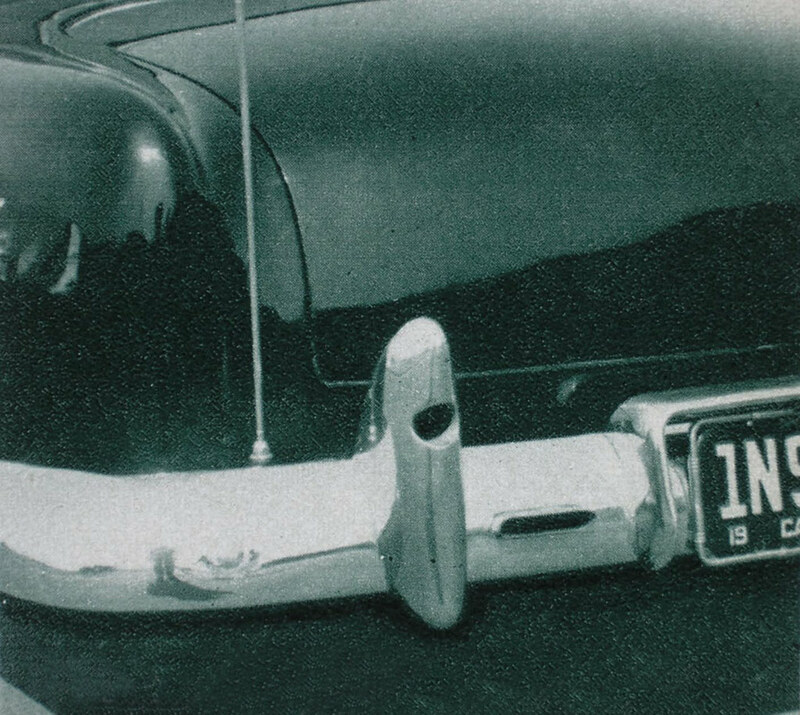 The ’49 Chevy license plate surround was modified to fit the ’51 bumper. The R&C article mentioned that 4 years ago when the car was originally restyled a 5 inch strip had been removed from the body. The other published articles had always mentioned it to be 4 inch. The interior colors for the car are now chartreuse and green. The car is now listed as being painted a deep metallic green when the photos for the July issue were taken. But Spence Murray mentioned in the article that right before the magazine went to print Mike had the car repainted all white. In the 1990’s I came across an article on the long career of Sam Foose. 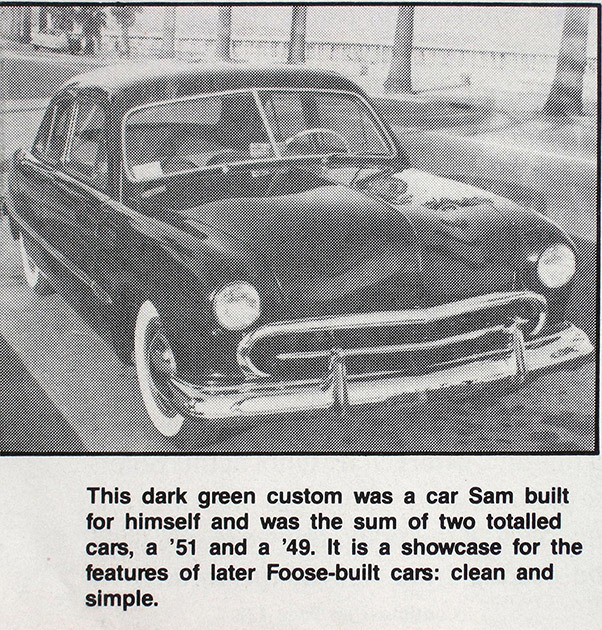 In the Street Rodder Magazine article there was a small black and white photo of the Mike Stone version of the car, mentioning that Sam Foose had build the car using two totaled cars ’49 and ’51 Ford. The article did not state when Sam had build the car. Sam Foose was born in 1934, so he would have been 16 in 1950 when this car was build. Not sure if it is a mix up, or if Sam perhaps worked together with Chuck Calvin, or perhaps he worked on the car for the last changes around 1953-54? Mystery! The new white paint shows off the radiused front wheel opening much better than the darker colors used on the earlier versions. Notice that the hood by now has been louvred and most likely the stock engine has been replaced, something Mike had mentioned in the R&C article he planned to do. 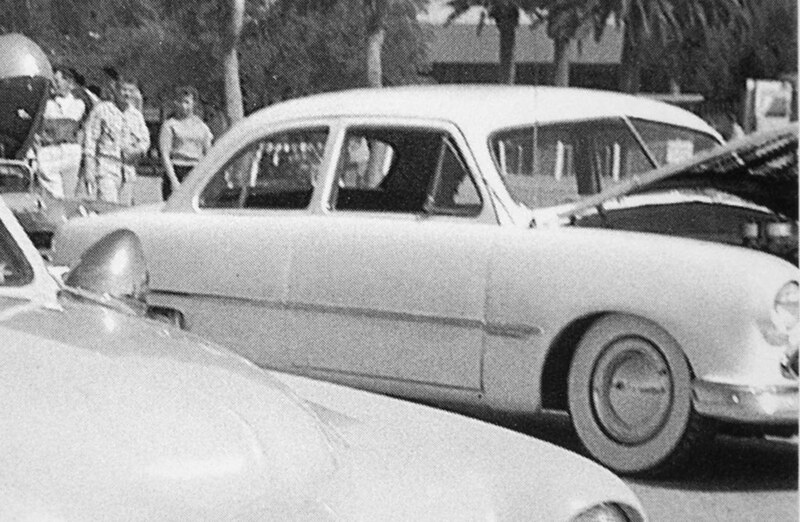 The photo was taken around 1957 I believe, and the car now has ’56 California plates on it. Again I’m not 100% sure it is the same car, but I do think it is. 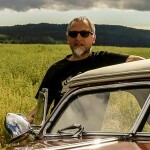 Now if all these photos are of the same car, the main question is… where is it now? what happened to it?